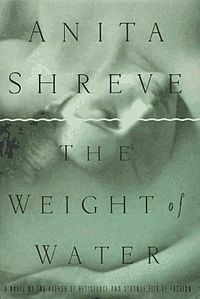 The Weight of Water By Anita Shreve In the late 1800's many fisher families from Norway emigrated to America in search of industry and a new life. Some of these immigrants made their way to the Isles of Shoal, a chain of islands off the coast of New Hampshire. Maren and her new husband John establish themselves on Smutty Nose Island. And it is there they experience harsh, solitary, difficult, long winter months. After a few years Marens sister, brother and sister-in-law arrive, along with her husbands brother. The addition of family makes times more tolerable but even so Maren has deep rooted problems with her sister and unwarranted love for her brother. There is murder, there is mystery. Intertwined with this story is Jean, her husband Tom, their daughter Billie and another couple on a sailboat near Smutty Nose in present day. Jean is doing a photo shoot for a magazine regarding the famous Smutty Nose murders that happened more than 100 years earlier. The weather turns badly, and so does the sailing trip. The writing of this story is captivating. It is eerie and suspenseful and it is a book I could not put down. Then Came You By Jennifer Weiner Jules is a Princeton graduate that becomes an egg donor. Annie lives outside Philadelphia and is a very young mom of two that becomes a surrogate to earn much needed cash and help her family, Bettina is billionaires daughter that hates and is suspicious of her new stepmother, and India is the stepmother that is unable to have a baby on her own. 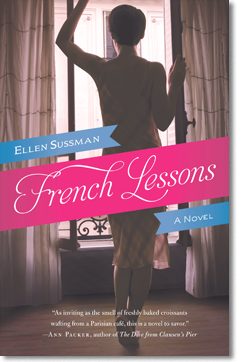 This book is filled with warm, likeable, intelligent women that come together under extenuating circumstances that would have once been deemed unique but in recent years become commonplace. It is a story full of lives, mostly realistic, some too predictable but nevertheless, Jennifer Weiner manages to pull it together with her wit, humor, kindness and characters. If you haven't read one in awhile, its a pleasant easy read that is surprisingly enjoyable.